And I live in a world where men sit and take millions and millions of dollars for their well-being instead of using it to better the country. This is the world I live in and this is the world I will never succumb to. I classify myself as abstract. In the world I live in there are the poor and the rich. In the world I live in, the poor have more values than the rich. The poor value what they have, they respect the people around them and work hard for every dime they earn. It is different with the rich you see … the rich choose to be materialistic. Everything about the rich one way or the other evolves around materialistic things. In the world I live in, the rich are proud and selfish. The rich do not see anything or anybody outside their circle of “rich”. In the world I live in, because one person can afford something expensive, the other less fortunate person gets that thing at all costs. It is more like a social status in the world of the rich but in the world of the poor, people manage what they have. The poor work for what they earn, they toil in the heat of the Nigerian sun, they enslave themselves to earn a living. The rich on the other hand don’t work for anything. In the world I live in, the rich inherit everything they own. I live in a world where children are born into suffering on one part of the country whilst on another part, children are born into pleasure and money. I live in a world where a nine months old child dies of a simple fever because the parents can’t pay the hospitable bills. I live in a world where a fourteen year old child is given £3000 to buy whatever they need. I live in a world where a grown man works as a driver to pay N5000 school fees for his children. I live in a world where millions and millions of naira are used on a child’s education. I live in a world where children of 5 hawk groundnuts instead of going to school. I live in a world where children ride the best of cars to school and don’t have to work to earn a dime. I live in a world where grown men and women beg for N5 to buy water. And I live in a world where men sit and take millions and millions of dollars for their well-being instead of using it to better the country. This is the world I live in and this is the world I will never succumb to. Growing up I have learned to better the lives of other people and I will never succumb to the lives of the rich. I classify myself as abstract. Because I am lucky to be born into the rich and I have seen the people on the streets suffer, I will never allow myself to be classified as rich. As long as I live in this world, I will continue to do everything to better the lives of others. In The World I Live In … We Are All Equal. 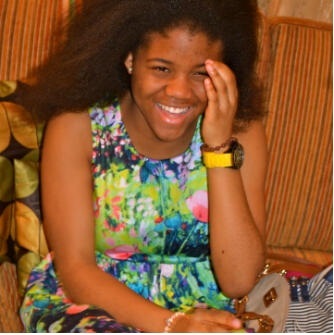 About the author: I’m Daniella Ekwueme, I’m 14 years old and I write occasionally. I love music and I play tennis for recreation. I’m a burgeoning writer. I love laughing and I think deep. I like to reason with other people and generally I’m a very friendly person. Daniella,U knw what? i feel so touched and ashamed of myself and my country…i feel so ashamed of myself in that i live in ur kind of world bt all i could do abt it is to concieve and have a group or private argument/discussion abt it nd that is all,forgeting dat public means like dis exist.Hw i wish any body could forgive me for not being responsible to dis extent..meanwhile i'm proud of u keep it up..love u…As for my country too many motive to be ashamed of her/leaders.GOD bless nigeria!!! Although your piece is heartfelt, but I can not neglect your stereotypical perspective of the rich. Not all rich people act in a one track mindset of reckless spending and uncontrollable display of arrogance. In fact as you get older, you will get to realize that even the poor people you so strongly write for don't even have the best of morals. Take a look at our history of past presidents, Most who claim they come from humble and poor background, one would expect them to turn the lives of poor suffering Nigerians around once they are empowered, but the opposite turns out to be our reality. So my dear, its not a war of the rich vs poor, its a war against GREED. You touched a bit about your privileged upbringing, but you are obviously turning out to be a remarkably humble young lady, so yes not all rich people are alike. Very beautiful piece, empathizing with the people. The undertones of rich and poor are nicely depicted. May all those who read this not only be touched, but be moved to effect change starting from their circles of influence. Daniella this is….inspiring.